Our online financial planning tool, WealthVision, supports the financial journey, providing 24/7 visibility and control over your entire financial picture. Get high-level net worth statements, detail on an investment’s performance, or information on an insurance policy you purchased years ago. 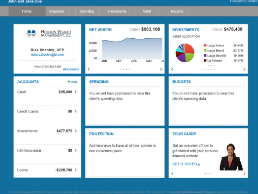 Get timely and accurate information about your investment accounts with Account View. It’s secure, convenient, and accessible from any device.